I’ve returned to Kathmandu and things seem back to normal here (to the untrained eye, anyway)—it’s just as loud and chaotic as when I first got here. It’s also very dusty. Face masks are popular in many Asian countries, but in places like Taiwan they’re mostly used for the purpose of protecting others when one is sick. Here, many people wear face masks because they must. The dirt here is as fine as powdered sugar and becomes airborne with the slightest encouragement. When you combine the dust with black plumes of exhaust belching from the backs of buses (how’s that for a tongue twister? ), then you become susceptible to throat and lung issues in a very short time. As an asthmatic, I find it particularly difficult and wear a scarf around the lower part of my face. At least here that’s normal—if I were at home, people would think I’m about to pull a semi-automatic. Patan: Patan is just outside of Kathmandu and is known for a picturesque Durbar Square that dates back to the 14th century. 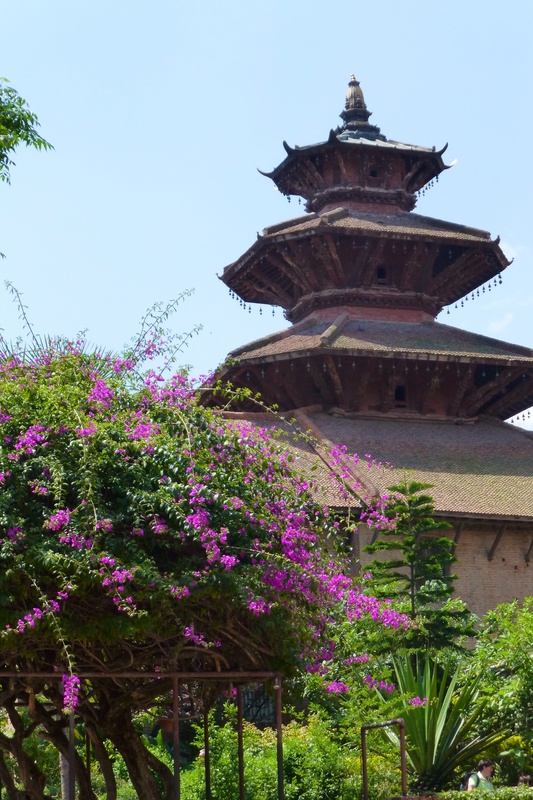 The town was not exactly a refuge from the madness of Kathmandu, but it has a not-to-be-missed museum with an exquisite collection of religious relics and a lovely, quiet courtyard. I was lucky to also catch a photo exhibit of Nepal in the 1950s and interestingly, it doesn’t look like much has changed since then. Maybe that’s why I like Nepal so much (despite my complaining about Kathmandu, I rather enjoy its “traveling back in time” quality). 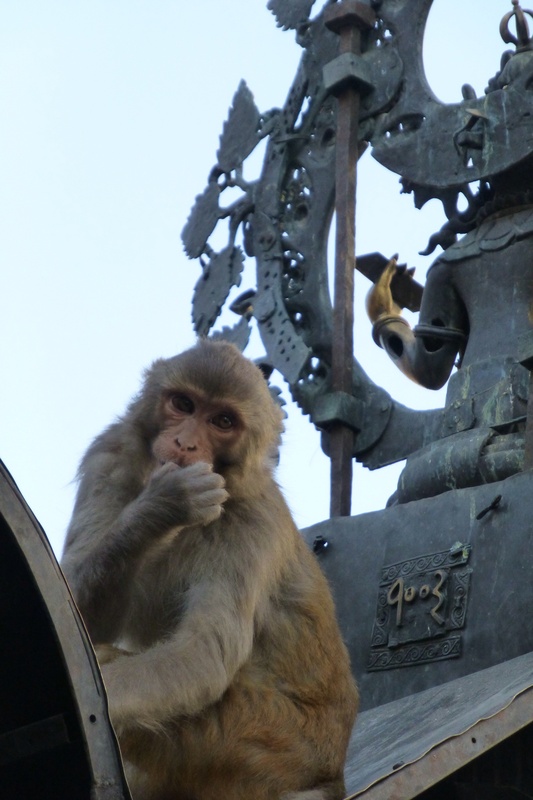 Swayambhunath: This UNESCO World Heritage site is also known as “the Monkey Temple” because of the myriad pink-faced monkeys that swarm the grounds (i.e., the naughty kind that you have to keep a close eye on). You climb to the top via 400+ well-worn stone stairs and once you reach the top, you’re rewarded with an amazing Buddhist stupa, many shrines to various deities (one of which is the goddess of smallpox, of all things), a tiny village surrounding all of it with shops and cafes, and fantastic views of the city below. Kathmandu looks a lot less dusty from above. 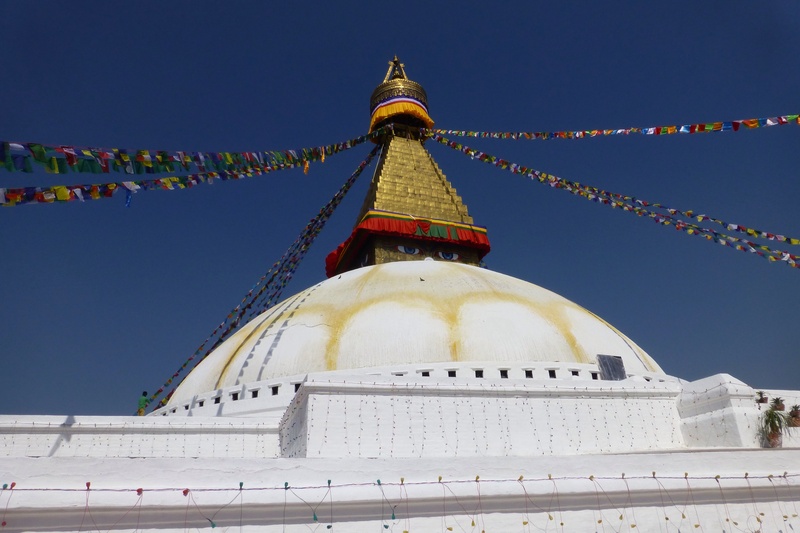 Bodhanath (Boudha): Another World Heritage site just outside of Kathmandu—this one best known for the largest stupa in Asia. 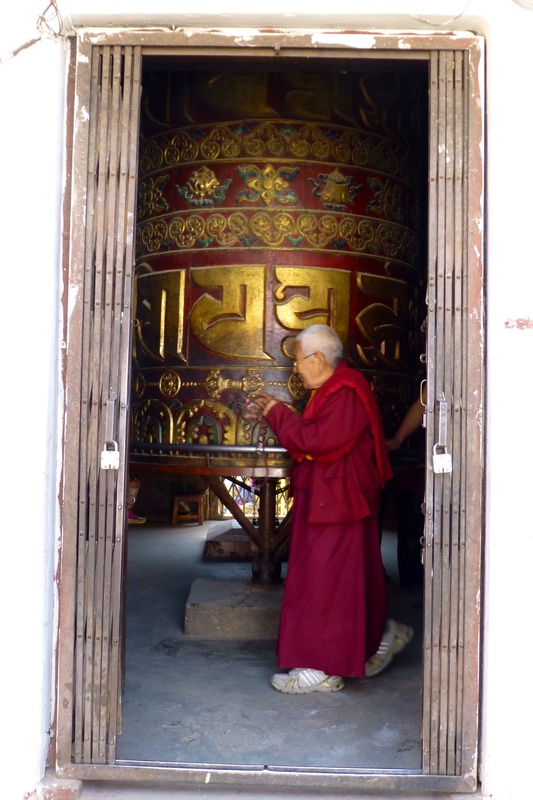 After performing my requisite circumambulation, I visited the Thrangu Monastery—Namo Buddha’s sister monastery—to inquire about their puja schedule so David and I can pay a visit when we return from our trek. That about covers my time in Kathmandu, with the exception of several smaller sights that I didn’t mention. David is now here (hooray!) and we are about to embark upon our trek. I hear there are a few rare spots on the Annapurna Circuit that offer Wi-fi, but I don’t actually count on it being available…nor do I want to worry about it while we are trekking. That said, I won’t post again until it’s over. See y’all in a few weeks! And say a few prayers to Ganesha for me…or to whatever deity you prefer.